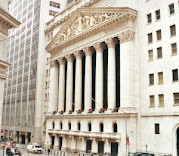 Bull Bear Trader: How Big Is The Bear? Zubin Jelveh provides an interesting chart (reproduced below) over at the Odd Numbers blog at Portfolio.com. In the article, Jelveh discusses how the S&P 500 (which is officially in -20% correction bear market territory) has been in a bear market six times since 1950. 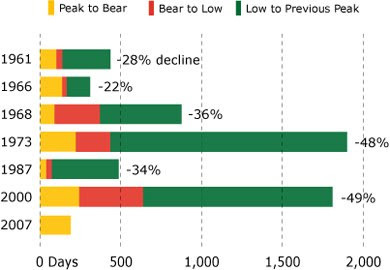 The chart shows the number of days it took to hit the bear market, how long from bear market start to market low, and low long before it made its way back to the previous peak. Overall declines are also included. From the chart, Jelveh identifies that there are two kinds of bear markets: Short (1961, 1966, 1968, and 1987) and Long (1973, 2000). If you take the averages, the current bear market will probably hit the low next summer, but not reach the peak again until 2011-2012. If that was not enough to depress you, it could get worse. Given that this bear market has the makings and headwinds of the longer version, this could be a difficult number of years. Hopefully in 10 years we will not be talking again about the "lost decade".